The minister was taken on a full tour of the building and he was very impressed with what he saw. Gaining support from ministers like Lord Elis-Thomas drives the charities passion and dedication to the restoration project they have planned. It also allows the charity to add further backing to funding applications they wish to submit. Over the next few weeks, if they haven’t received them already, residents will be getting a newsletter and donation pack through their doors, delivered by Resolven Scouts. 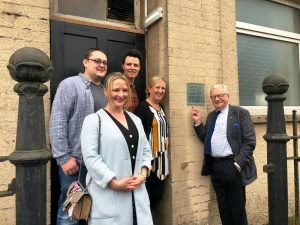 Donations will allow the charity to continue to invest in the repair jobs that are so desperately needed to allow the building to remain open whilst the trustees continue their hard work in the background, gaining support and funds for the project to develop.